I am a food and racial justice activist. I am also a nutrition practitioner and future Registered Dietician. Rarely do I feel these two identities cross over. And that’s perplexing. 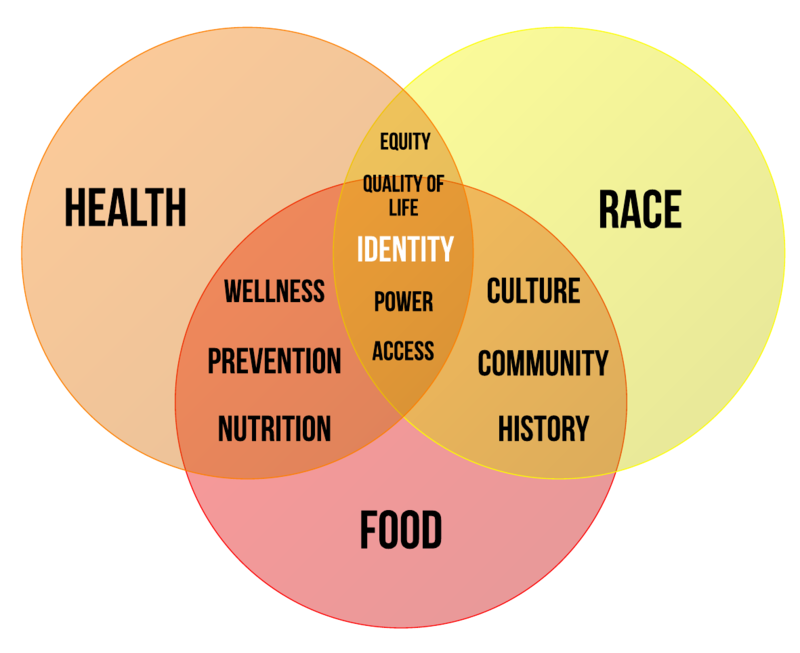 In my eyes, race, food, and health are deeply and complexly entwined. Never, not once, in my years in the nutrition field have I been able to separate the three. Yet everyday I struggle to hold meaningful conversations with folks in my field –a field that is predominantly white women in their thirties–about how race, power, and oppression shapes food, health and how they deliver dietetics to patients of color. Coincidence? I think not. Nikki Henderson is the ( former) Executive Director at People’s Grocery, a grassroots food and racial justice organization in West Oakland, CA. In 2013, Nikki shared her story illustrating how deeply food, health, and race are tied in her life. African Americans are twice as likely to be diagnosed with diabetes than non-Hispanic whites. In 2010, African Americans were 2.2 times as likely as non-Hispanic Whites to die from diabetes. African Americans are more likely to suffer complications from diabetes, such as end-stage renal disease and lower extremity amputations (source). Ivori Holson shares a similar narrative in At Needle Point, a short video featuring her spoken word. These health inequities pop up in many communities of color with many other diet-related diseases and yet the workforce to prevent and treat them is starkly underrepresented by POC. By 2050, people of color are expected to make up more than 50% of the US population. If health trends in our communities continue as they do, racial disparities in diet-related disease will not be a minority issue, but that of the majority. On the other end, The Academy for Nutrition and Dietetics, the agency in charge of producing experts in the field of food and health, continuously fails to reflect those in our community. In 2012 the Academy for Nutrition and Dietetics reported Blacks and African Americans represented 3% of their over 55,000 Registered Dietetics members, while whites inhabited 85% (4% were Asians, 3% Hispanics/Latinos, 1% other). [Right] Population projections for 2050. [Left] Racial representation in dietetics. This lack of racial representation produces disparities both within the field as well as in community. As part of the 4% of Asian Pacific Islander (API) dietitians I’ve experienced a lack of cultural awareness and competency amongst my white peers who do not share the same experiences of oppression and disempowerment with food and health as their POC clients. This can lead to cultural distancing, microaggressive interactions, and ineffective or low quality care, which ultimately makes nutrition inaccessible. That access to food-related health goes beyond patient-practitioner barriers. When your identity isn’t reflected in a certain space–be it professional or personal–the natural tendency is to look elsewhere for community. As a field that’s 85% white, POC may not see dietetics as a safe and productive space to build a career. A lack of resources for POC, marginalization, and isolation are all realities that I face everyday. As a field, we also lack perspectives, views, and experiences that can enrich and develop the the quality and effectiveness of dietetics. Seek feedback from those who matter by building a task force of students, staff, and faculty from multiple disciplines. Make Cultural Competency Training a graduation requirement. Develop a pipeline program to expose youth of color to careers in dietetics. Require staff and faculty to attend regular cultural competency training. Regularly evaluate systems using outside expertise. Hire a Minority Services Coordinator. If you want to dig deeper, check out my policy brief Race Matters: Increasing Cultural Competency and Racial Diversity in Dietetics. Feel free to share this document far and wide!